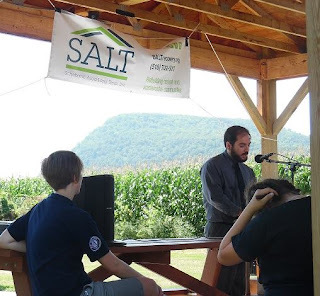 The Village of Middleburgh was the host for SALT putting on a 5th anniversary remembrance of the disastrous flood that hit Schoharie County at the end of August 2011 and severely impacted many surrounding regions. The event began at 1pm in Timothy Murphy Park, in the pavilion erected by Middleburgh Rotary and the Knights of Columbus, to replace the one that was destroyed in the storm. Roland Vinyard provided the welcoming music. Jerrine Corallo, project director of SALT, introduced all of the speakers at the event, but now referred to SALT Development, Schoharie Area Long Term Development, rather than SALT Recovery, as it was previously known. There was a recollection of what had happened in those early days following the flood, of organizing volunteers, that they came from near and far, and of how many people were helping their neighbors ­­­ the resilience of our communities. There was a poetry reading by Jennifer Mosher, of he did this and she did that, referring to character rather than countless names. Sarah Goodrich, executive director of SALT, referred to a community development organization, seeing the faces of confusion becoming the determination to get houses rebuilt and having roads become communities, with new businesses arriving, and the comments on their “dream” boards expressing wishes for living up to this county's potential. By way of introducing the keynote speaker, Josh DeBartolo, a joking reference was made about a ceremonial cutting of a year's worth of Josh's hair on the first anniversary. He committed so much of his time to recovery efforts, he didn't have time for that. Josh said that what has been achieved since the flood has been “unimaginable” in the wake of that disaster. With his wife, Alison, and baby boy, Josh sat down with a storybook, to tell Blake about the heroes who appeared. You would meet Courage, who stood up to the challenges, and Empathy, who would tear down walls among people as well as from buildings. There was Dedication. Quiet Leadership led by example, and Hope went door to door, with the message that we will rebuild. With these heroes, we can change the world. A number of those leaders would address the group, starting with State Comptroller Thomas DiNapoli. He helped to get a volunteer team of union members to work on one house, which inspired them to assist with others as well. Sarah Goodrich commented, at this point, that the storm was part of our history, but doesn't define it. Assemblyman Pete Lopez was in attendance with his wife, Bridget. He told the story of his father bringing the family to this valley 44 years ago, and it took time for them to put down roots, but during the flood, his family suffered the personal impact of losing their home. Lopez fought for recovery funds, adding that we need to be prepared, by preserving today and strengthening for tomorrow, citing the value of 3 new cell towers planned for Route 30. He commented that there are still issues with NY Rising. Senator Jim Seward, who could not attend, sent a letter to be read at the event. Schoharie Town Supervisor Chris Tague lost is own house in the flood and had considered moving away, but stayed. He praised the efforts of first ­responders, specifically citing the Middleburgh Fire Dept, and Chief Mike Devlin who was in the crowd. Schoharie Mayor John Borst commented that there was nothing about the damage of the flood that time and money couldn't fix ... and he had the time. The crowd laughed, realizing that the difficult element of the fix was getting the money it would take to do it. He also gave praises to the work of Emily Davis with volunteers, and she quickly added the names of others. Mayor Borst noted that SALT was morphing into economic development. Middleburgh's Mayor Matthew Avitabile and Supervisor Pete Coppolo spoke about the Valley's recovery and thanked volunteers. The event ended with a statement from Pastor Peter DeBartolo and a prayer.